One of the oldest and most important Jewish communities in Europe was in Worms. It was the site of the rabbinic and scholarly activities of many great Jewish leaders, first and foremost among them Rashi. 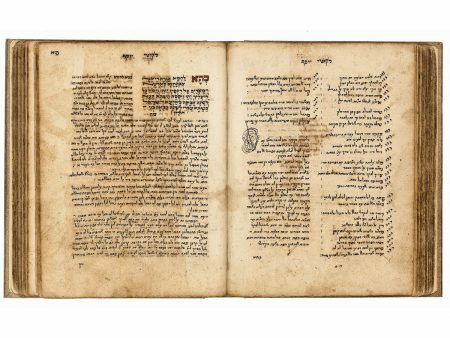 The scholarship and ancient traditions characteristic of the Jewish community in Worms are reflected in the minhagim (customs) that Juspa, the author of this volume, and others recorded and preserved. These customs reflect Jewish life in the synagogue and the home throughout the entire year. In minute detail and with close attention to all manifestations of religious behavior, both public and private, the ways of everyday life are revealed in Juspa’s works. Juspa was born in Fulda in 1604 and died in Worms in 1678. He was a student of Elijah Loanz, the Ba’al Shem of Worms (cat. no. 27). As shammes, Juspa served the Worms community in many capacities, including those of scribe, notary, trustee, mohel, and cantor. He was a talented writer and compiler; he paid special attention to the music of the synagogue and also composed poems. Juspa’s works are a mine of information on the Jewry of Worms and beyond. He wrote the Wormser Minhagbuch and Ma’aseh Nissim, in which he retold stories of Worms Jewry as recounted by the elders of the community. In addition he authored Sefer Likkutei Yosef, displayed here. Eidelberg 1991; Hamburger 1988–1992, vol. 1, pp. 23–48.